This is not a review. This is a read-in-progress. I received a copy of this book from my dad, for Christmas. Closed Casket is the new book from Sophie Hannah, who was authorized by the Christie estate to write more books featuring Belgian detective Hercule Poirot. Hannah is a well-received writer of psychological crime thrillers, as well as a poet. The Washington Post’s review notes that Closed Casket “lacks the special charm of the originals”, yet calls it “endearing”. They wanted more of Poirot’s larger-than-life brilliance, I suspect. I suppose it’s difficult to take one author’s character and write with her template in mind. I won’t let this review color my judgment – I find the first few chapters well-written and intriguing. I’m not a fangirl nitpicker, I just want to read an interesting mystery, regardless of who reboots the franchise. The Christie estate has resisted what The Guardian calls “authorial regeneration” for the longest time. I guess the truth is that ultimately, nobody will measure up to Agatha Christie. It’s ten days before Christmas, and my mother is clearing up the clutter of boxes lining our hallway. The boxes are full of books – books meant to be shipped to her home town. Just a week ago she went to the warehouse sale of a publishing house and made away with yet another box of books she got for PhP5 apiece. Our hallway looks like a warehouse of books. On Monday she plans to ship them all off to San Enrique. We wonder why she waits until the very last minute to do things like this. My father is frustrated by the amount of clutter. He wants an orderly house by Christmas. My mother is doing her best. Our house will never be one of those showcase houses, the kind you see in the magazines or on tv. It’s a decent-sized condominium unit good for a family of six, but we are overrun by books. In the living room we have a floor-to-ceiling bookshelf screwed to the wall (in case of earthquakes), and it’s full. There’s another shelf just for my niece’s children’s books. Every bedroom has bookshelves, but we are out of space. We have given away or donated boxes of books but we never seem to create significant space for new ones. In the last couple of years we have been buying e-books so that we can just store them in our smartphones and e-readers instead of real books taking up space. 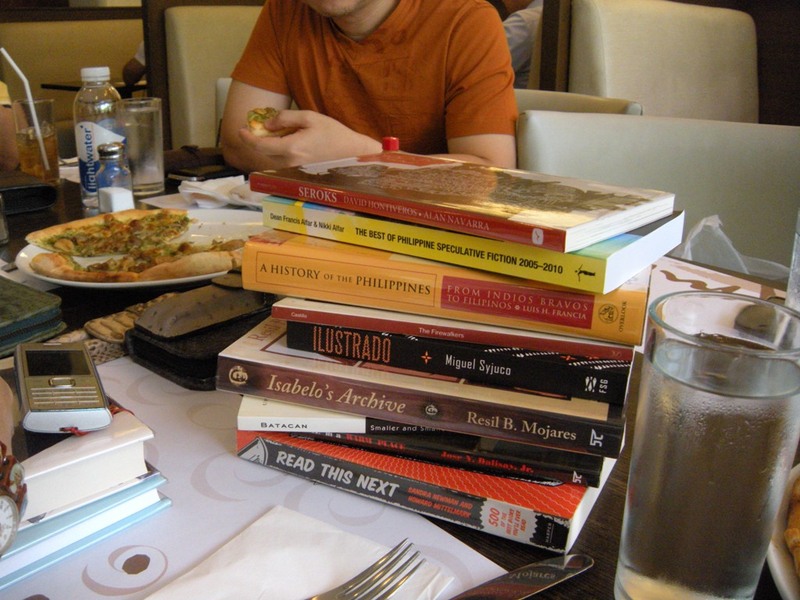 But we have also been regularly attending the Manila International Book Fair every September, buying books for gifts. Our folly is that we can’t resist real books – you don’t need a battery to read them, and it’s comforting to have a tsundoku pile near your bed in case you can’t sleep. My mother is a retired professor who raised us to read, read, read. We daughters feel like Belle from Disney’s “Beauty and the Beast”. Life hasn’t become an episode of “Hoarders” yet. Too many books is not such a bad problem to have. We just need to make an act of will to give away the books we no longer read to others. The 34th Manila International Book Fair is back! We went yesterday, on the first day, and were surprised by the number of people at opening time. It’s good to know Manila has its share of voracious readers of all ages! For the past few Book Fairs, my decision has been to buy books by Filipino writers – we must support our own – with the occasional international trade paperback. Prices were slashed by 20% to 50% for most outlets. My haul above was quite modest, given my limited budget and the fact that I’m running out of bookshelf real estate. 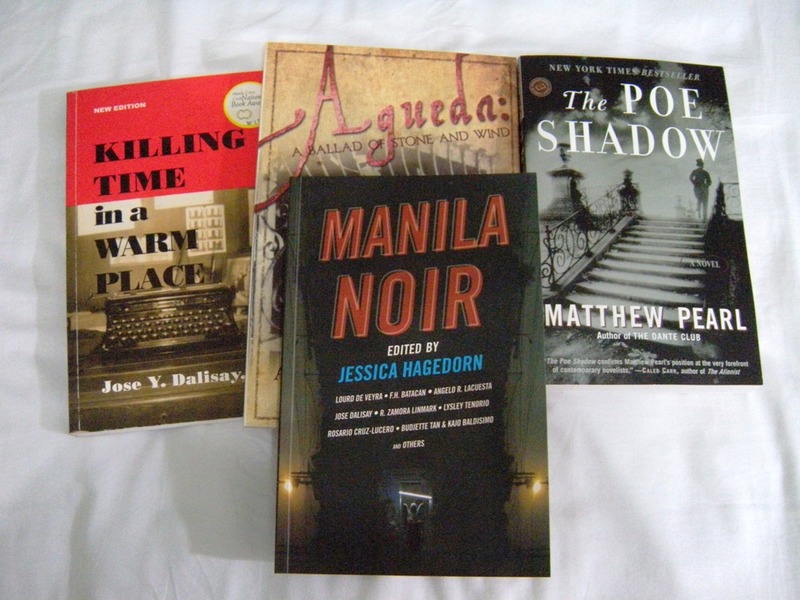 From Anvil Publishing I got Manila Noir, an anthology edited by Jessica Hagedorn (20% off), and Jose Dalisay, Jr.’s Killing Time In A Warm Place (50% off, since it was the only copy available). “Killing Time” will go to a friend in the US, after I’ve had Butch Dalisay sign it at one of our fountain pen meets. I also got Anna Maria L. Harper’s Agueda: A Ballad of Stone and Wind from University of Sto. Tomas (UST) Publishing House. That one was P400 (I wonder if it’s because UST just turned 400 years old?). It’s in my local book club reading list. For my father I got Matthew Pearl’s The Poe Shadow (20% off, from Fully Booked). I also went to Cosmos Bazaar’s stall, where they were selling Pilot Pens galore. I got two Pilot 78Gs and a Birdie (fountain pens, for P220 and 180 each). The sales staff gave me a Pilot GreenRoller rollerball (with refills available at National Bookstore) and a 5-inch Pilot teddy bear on a keychain as promo items! One thing I noticed about the Book Fair this year is that there seem to be less exhibitors, but these exhibitors had bigger stalls. The food area was also much smaller. Albergus catered as usual, but served undercooked pinakbet as a side viand with their lunch, not to mention undercooked rice. However, their roast beef was excellent. Maybe on the other days of the Book Fair their food will improve, and we were just unlucky to have had lunch there on opening day. It’s worth a visit! The 34th Manila International Book Fair is from Sept. 11-15, 2013, 10:00am to 8pm, at the SMX Convention Center, SM Mall of Asia complex, Pasay City. One of the members of our Manila fountain pen group decided to start a small book club. We had our first meeting last weekend, where we figured out what books we’d all like to read. We’ll focus on a book each month, focusing initially on Filipino writers writing in English. There are so many good books out there, but it’s a shame not to read the writers of one’s own country. The guys in our group made a request not to have to read romance novels, and the rest of us heartily agreed (hahaha!). This May we’re tackling the late Kerima Polotan‘s 1961 Stonehill Award-winning novel “The Hand of the Enemy”. In June we’ll be reading her collection of essays “Adventures in a Forgotten Country”. Both books are published by the University of the Philippines Press. Also in our list is Jose Y. Dalisay, Jr.‘s Killing Time in a Warm Place (Anvil Publishing), a novel based on his experiences as a Martial Law detainee. (Incidentally, Butch Dalisay is the founder of our fountain pen group. We’re asking him to sign our copies.) We’ll follow with National Artist Nick Joaquin‘s May Day Eve & Other Stories. Next up is Esteban Javellana‘s 1947 classic “Without Seeing The Dawn” (which was made into a Tagalog tv mini-series when I was a child). We’re also reading young Palanca winner F. H. Batacan‘s mystery novel featuring a “Jesuit priest who is also a forensic anthropologist as sleuth”, Smaller and Smaller Circles (UP Press). Then we’ll read another classic of Filipino immigrant fiction, Carlos Bulosan‘s America is in the Heart (Anvil Publishing). Just so we don’t get stuck on novels, we also picked a book of essays edited by Erlinda Panlilio, The Manila We Knew (Anvil Publishing). Then for something totally different, there’s Resil Mojares‘s Isabelo’s Archive (Anvil Publishing), a compilation of essays and notes on Philippine culture and history, based “on Isabelo de los Reyes’ groundbreaking attempt to build an archive of popular knowledge in the Philippines.” And then there is Bambi Harper‘s new historical novel, Agueda (University of Sto. Tomas Publishing House). There is also Luis Francia‘s History of the Philippines: From Indios Bravos to Filipinos to consider. The titles or order of reading might change. But it’s good to have a reading list. If we didn’t sit down to plan this, we wouldn’t know where to start! We can’t always meet in person, but we can always email our reading notes to each other. I just found out via The New York Times today that Polish poet and 1996 Nobel prizewinner Wislawa Szymborska had passed away. I had been lucky enough to buy a copy of her book, View With A Grain of Sand: Selected Poems, several years ago at a local bookstore. Later, I found that my sister also owned a copy of her Poems: New and Collected, which contained basically the same poems as in my book, but including newer works. A former member of the Polish Communist Party, Szymborska later turned away from her early “Stalinist” work. She was also an essayist and translator. Shortly after winning the Nobel Prize, she said in a New York Times interview that although “life crosses politics… my poems are strictly not political. They are more about people and life.” Many of her poems that I have read deal with the aftermath of war, of people rising from its ashes. Her words can be stark, but manage to convey hopefulness and sympathy. Die — you can’t do that to a cat. At at nighttime no lamps are lit. on what not to do with a cat. this course is offered only once. There are more translations of Szymborska’s poems online on the Polish-American Network, Poets.org, and the State University of New York (Buffalo).